The German Shepherd Dog is a versatile working dog, capable of being successful with many different sports, activities and jobs. As a working breed, a German Shepherd dog is happiest when given something to do. Whether that is a dog sport, service work or being included in family activities - this breed thrives when provided with proper physical and mental stimulation. Since the German Shepherd Dog is such an athletic and intelligent breed, it would be a shame not to utilize their abilities or provide the proper stimulation for a dog of this caliber. The German Shepherd Dog is ideal for active homes and working homes, and thrives in an environment where one appreciates the history and purpose of the breed. The German Shepherd does make a phenomenal family companion, but as a working breed they thrive when they are active and given some sort of job to do. Military dogs undergo vigorous training and face hardships no other dog could ever imagine facing, and they do so with heart and passion.These dogs are carefully selected and have proven themselves to be exactly what the breed was meant to be. Military dogs are expected to fulfill duties such as bomb detection, apprehension, scouting, acting as a deterrent and more. 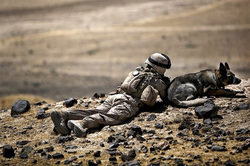 Military dogs work all day, in often extreme conditions, and are expected to be tireless, relentless and courageous on the job. The German Shepherd dog makes a phenomenal search and rescue candidate, due to their driven and enthusiastic tracking ability and their excellent noses. A search and rescue dog, especially emergency and disaster response teams, are incredible animals that require a very specific, stable working dog temperament and hardiness in order to work in such harsh and stressful conditions. 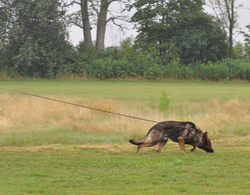 While this is difficult work, it is unbelievably rewarding for handler and dog. 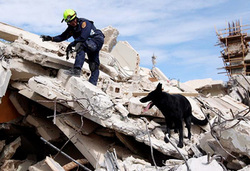 Disaster response work can be very long, stressful events for dogs so strong nerves, high thresholds and relentless drive is important in search and rescue prospects. Due to their fantastic noses and natural detection and tracking ability, the German Shepherd dog excels at detection work. These brave, driven dogs are often put in the line of danger to protect and rescue their human handlers. Much like police and military dogs, they undergo extensive training for a very rewarding and important career. Narcotics, bomb and arson detection are not easily pursued due to law enforcement restrictions and lack of certified trainers. Human remain detection (HRD) and bed bug detection is more common and accessible to the public! The German Shepherd dog is the perfect candidate for family or estate protection, having the drives, courage and family loyalty to make a fantastic protection dog for family and home. 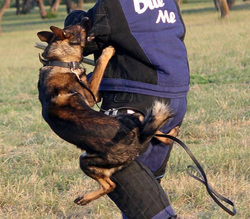 Unlike in protection sports, dogs trained for personal protection are required to be more serious and intense in the work. 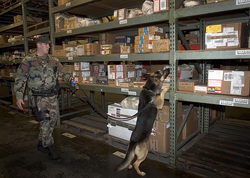 Protection dogs are a combination of visual deterrent, threat control, and the ability to bite and fight when a true threat presents itself . Training for personal protection involves real world scenarios and training close to the location the dog will be required to protect. The German Shepherd is a loyal, intelligent breed of dog that is dedicated to its handler, loves to work, is easy to train and is very versatile. This incredible versatility means the German Shepherd dog can fulfill a wide variety of roles and do many different kinds of jobs for their handler. German Shepherds are great candidates for guide dogs, seizure alert dogs, mobility assistance and so much more. Stable temperament, strong nerves and the drive to work are important traits of a successful service dog. 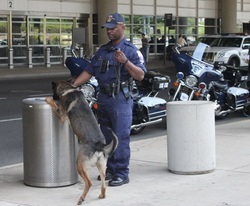 The use of German Shepherds in airports across the world is becoming increasingly common. There are many different roles available for dogs to fulfill, such as detection work, acting as a deterrent, crowd control, criminal apprehension and even wildlife control. These dogs are notorious for working long, long hours and dealing with intense environmental stress and a chaotic working environment. A calm, stable, well mannered German Shepherd dog makes a wonderful Therapy Dog. 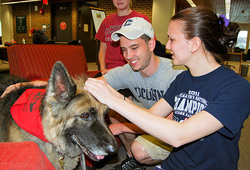 Therapy dogs provide important support, joy and stress relief to many different types of people. Hospital patients, senior citizens, children with disabilities, children who need assistance reading and many more can benefit from a German Shepherd therapy dog. The German Shepherd Dog was originally bred as a herding dog, built for a long day of guarding and moving sheep over great distances. The 'HGH' was the original herding test for the German Shepherd dog, but thanks to the breed versatility the GSD is able to adapt to all types of herding successfully. Herding is a very rewarding sport for dog and handler, and is readily accessible to the community. 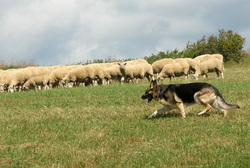 Consider taking your GSD for a "Herding Instinct Test" to see whether or not it would be a good fit for you and your dog. 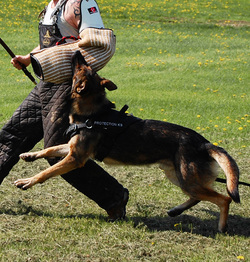 IPO (formally known as Schutzhund) is a protection sport with three phases; Tracking, obedience and protection. This sport was originally designed to evaluate the German Shepherd dog for breed worthiness, but is now a widely enjoyed sport available to any dog capable of the work. IPO is a triathlon for dogs, requiring dedication, intense training and hard work for the dog and handler. Dogs that successfully compete in IPO are pushed to their limits and shaped into stable and obedient companions. Photo credit to Wolfgeist German Shepherds. PSA, which stands for Protection Sports Association is a high intensity bite work sport that involves pristine obedience and real world protection work under heavy distractions. Unlike in IPO, PSA does not have a tracking portion and focuses on the obedience and protection aspects of the sport. PSA is not as routine and patterned as IPO. PSA uses heavy environmental distractions and pressure with numerous objects during protection and obedience; PSA uses heavy voice opposition from the decoy as well. PSA also includes some real world protection scenarios such as object guarding and defense from within a vehicle. While this sport is dominated by the Belgian Malinois and the Dutch Shepherd, the German Shepherd Dog can excel. Photo credit goes to vom Anfang German Shepherds. 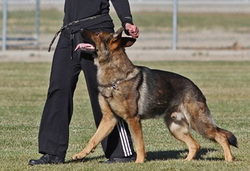 French Ring is a protection dog sport most similar to Campagne, Mondio Ring and Belgian Ring, but also sharing common elements with Schutzhund and KNPV. There are 4 titles that can be earned: Brevet, Ring I, Ring II and Ring III, each level introduces progressively more difficult situations and makes greater demands on the dog. French Ring requires a dog to function in agility, obedience and protection and makes use of a gun and clatter stick during protection routines. The German Shepherd dog can be entered in dog shows at the Canadian Kennel Club, American Kennel Club, United Kennel Club and the German SV show ring. Conformation judges a dog's structure and movement and involves stacking and trotting the dog within a designated show ring. 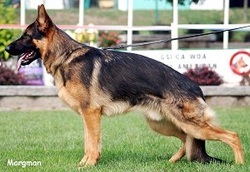 This is a great sport for those who love competition and are interested in the conformation of the German Shepherd dog. The German Shepherd dog should be a naturally biddable, easily trained and handler oriented breed which makes them a joy to work with in formal competitive obedience. 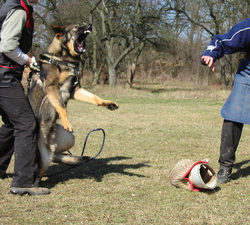 The German Shepherd dog excels in obedience, and can easily obtain high level titles with proper guidance and training. Formal obedience involves a routine including various drills such as on and off leash heeling, long downs, commands out of motion, retrieving, jumping over obstacles and more! A fun, less formal and fast paced style of competitive obedience that is ideal for new competitors! This sport consists of completing tasks allocated to various signs along the course, allowing handlers to guide their dogs and have fun. The German Shepherd is an agile, energetic breed making it suitable for the sport of agility. 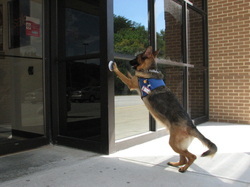 Smaller German Shepherds with appropriate functioning structure can be very quick over obstacles. 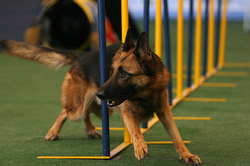 Agility involves teaching the dog to maneuver various articles in a fast paced routine, which also requires the dog to "touch" targets on each obstacle. Weave poles, teeters, jumps, tunnels and tables are a few pieces to the agility puzzle! 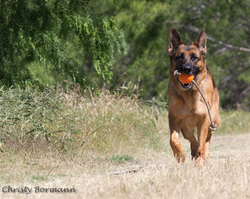 This is a fast paced sport perfect for high energy German Shepherds that love to run. The German Shepherd is a natural, methodical tracker with an excellent nose. Tracking is very rewarding for dog and handler, as the German Shepherd loves to execute their natural tracking instinct and ability. Often, the reward for the dog is in completing the track and locating the source. Tracking is an excellent sport for this breed, suitable for any dog that enjoys tracking and will work for long periods of time on a track. Requires focus and dedication from the dog. Nose work is ideal for the German Shepherd dog due to their expert noses and phenomenal scenting ability. The German Shepherd's phenomenal scent detection should be an innate ability, allowing a dog to pinpoint different scents in any environment. Dedication, enthusiasm, tracking ability and hunt drive make an excellent nose work prospect. Nose work asks a dog to locate and notify the handler to the finding of specific odours. This sport is rewarding for dogs that love to track or use their nose! Barn Hunt is a newer sport quickly gaining fans, and has been met with great enthusiasm and excitement! 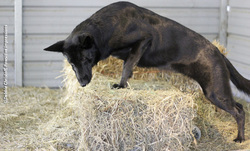 Barn Hunt requires dogs to maneuver a barn setting and hunt for rats contained within tubes. They must locate and indicate the real rat in the tube within a specified time frame, discerning the real rat from an empty tube and a tube filled with soiled rat litter hidden along the course. 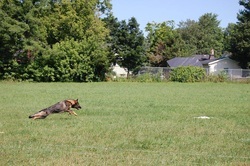 Fly ball is a fast paced sport that is perfect for any ball crazy German Shepherd dog, allowing the dog to race against others in a relay style setting. The dog is expected to jump a set of height appropriate hurdles before hitting the box that launches the ball for them to take, requiring the dog to turn quickly and return to the handler to allow the next dog to take off! A perfect sport for high energy German Shepherds that will do anything for a ball! This is a fast-paced, fun sport! Ideal for any German Shepherd with lots of energy and high prey drive, this fun sport requires the dog to chase a lure across an open field for minutes at a time. This sport tests a dogs endurance and natural drives, requiring the dog to complete the course enthusiastically and without hesitation, chasing the lure across the course. A great sport for those new to dog sports, since no work is required of the handler other than releasing the dog and catching the dog on the course. The perfect sport for a water loving German Shepherd dog, dock diving requires dogs to jump from a high dock into a pool of water. The sport has four different disciplines, Big Air, Extreme Vertical, Speed Retrieve and Iron Dog. For dogs that love to swim and retrieve, this is an excellent sport to get involved in. It is also easy to train for, since you can practice on any dock you can locate that is okay for use. Weight pulling tests a dog's strength, endurance and mental fortitude by having the dog pull against resistance and pull weight from point A to point B. 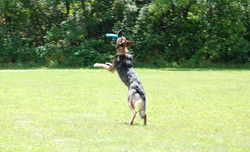 The German Shepherd excels at this sport, and is a great way to build muscle and endurance. The sport measures weight pulled per pound between two points and titles are awarded as dogs pull more and more weight successfully. 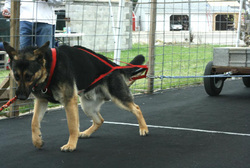 This sport is ideal for driven dogs with correct, healthy structure that love to pull and overcome physical challenges. Also known as "frisbee dog", this sport is great for dogs with higher prey drive and a love of catching and retrieving toys. 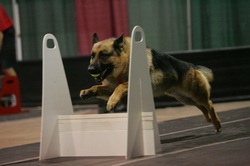 This is a high energy sport making it a great outlet for tireless German Shepherd dogs. This sport is ideal for handlers new to dog sports, since it is easy to train on your own and can be a very inexpensive sport to enjoy with your dog! 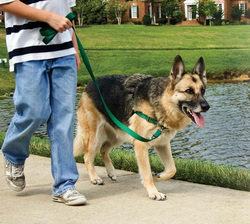 Taking your dog for a walk is a very enjoyable, sometimes therapeutic activity for you and your dog. Your German Shepherd dog will gain physical and mental exercise out on a walk as they investigate smells, stretch their legs, watch people and dogs pass by, and simply enjoy being out with you. Adding some obedience training in your daily walks can improve the quality of the experience. Ask your dog to sit at the street before crossing, to down on the sidelines as another dog passes, or to heel for several minutes at random intervals. Including rewards (toy, food, praise) for success will satisfy your German Shepherd's desire to work and please you. Hiking is a very rewarding activity to enjoy with your German Shepherd dog! 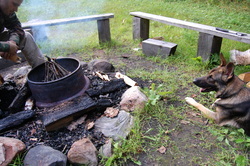 Long distance hikes, especially in natural areas, is exactly what you dog loves to experience! The vast array of sights, sounds and smells will provide excellent mental stimulation. Long distance walking, trotting or running is exactly what a dog is designed to do, so it is no surprise that hiking fulfills exercise requirements for more dogs. Off leash hiking for dogs who have a good foundation in obedience (recall, sit, down, stay, etc) is even more rewarding and enjoyable. The German Shepherd dog is built to trot for a long time over great distances, so jogging with your German Shepherd dog is a perfect form of exercise. 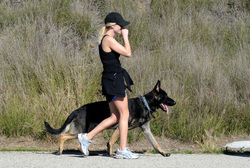 Running with your dog provides an excellent physical work out and is also great mental stimulation. Since running is a more intense form of exercise, dogs who run with their owners should be cleared of any orthopedic disease and hip/elbow issues. Dogs should also reach full physical maturity before running long distances. 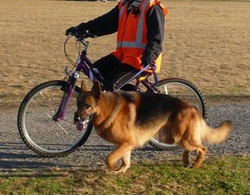 The German Shepherd dog is built for trotting long distance for long periods of time, which is why taking your dog for a bike ride is a great form of exercise and mental stimulation! There are different harnesses and bicycle attachments you can purchase to make riding your bicycle with your dog more safe, care free and enjoyable! Much like with running, your German Shepherd should be physically mature and of sound orthopedics and health prior to becoming a bike ride companion. 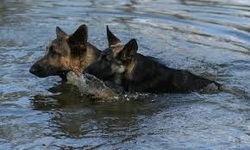 Swimming is an excellent form of low impact exercise for any water loving German Shepherd dog. Swimming is an excellent way to safely tire out your dog, build muscle and tone, improve endurance and provide fun and enjoyment to your German Shepherd dog. While the German Shepherd is an athletic dog that has a warm double coat, be wary of very cold water and potentially dangerous currents and undertows. The German Shepherd dog typically loves to retrieve, making fetch a great activity for you and your dog. Throw a toy, let your dog chase it and bring it back, then repeat! Fetch is a good way to let your dog run at its own pace, while encouraging the heart to beat faster and improve circulation and endurance. Two ball is a fast-paced game for high energy dogs, and it involves throwing one ball and throwing a second ball immediately when you dog returns to you with the first ball. The German Shepherd Dog is a hardy dog perfect for people and/or families who love the outdoors.The German Shepherd dog makes an excellent camping companion because they are naturally alert and in tune with the environment, able to alert to any potential danger or unwanted animal visitors, capable of being active all day long, have a weather resistant coat and love to be outside. Equipment such as life jackets, cold weather jackets, backpacks and similar things are great to include in your camping gear!